I was looking for a gentle approach to grammar for grade 1. We are relaxed homeschoolers meaning we use curriculum that works for us as a family and each individual child following no specific homeschooling style. I was pleasantly surprised with First Language Lessons Level 1. It ended up being amazing for not just my grade 1 daughter, but also my preschool son! Based on my daughter’s learning style, personality type and my teaching style, below is my detailed review of First Language Lessons Level 1. There was no exchange for product in this curriculum review. All thoughts expressed are my own. 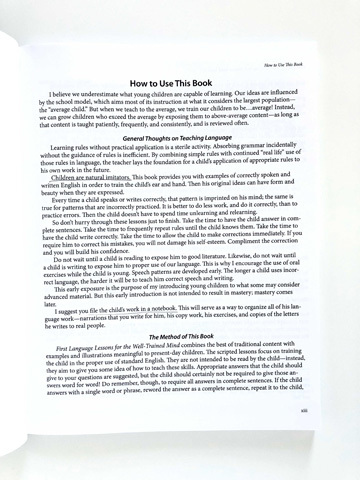 First Language Lessons Level 1 is an all-inclusive book meaning it has both the Teacher’s and Student portion included. Isn’t that amazing!? 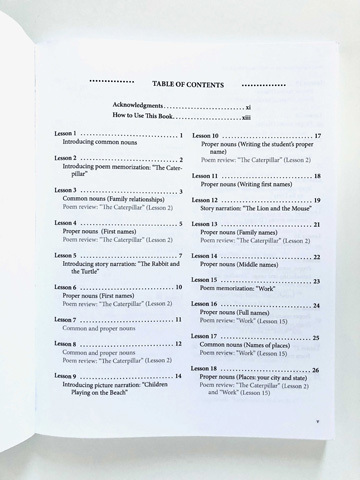 Table of Contents – I wanted to know how many lessons we were conquering in the year. There are 100 Lessons. Scripted. This is just what I need! 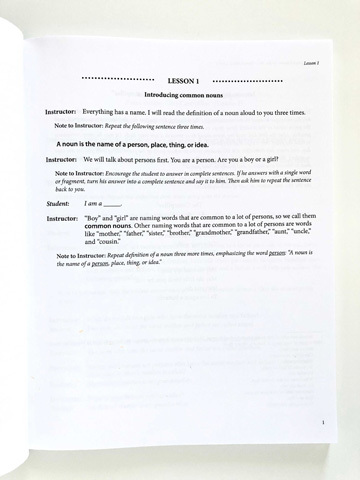 It indicates Notes to Instructor and what the Instructor needs to say. There are 100 lessons. It suggests planning 2-3 lessons per week, which is such a gentle approach and one we loved. Repetition = increase in memory. At the beginning you don’t know how your grade 1 child will be able to memorize a poem or definitions, especially with only doing 2-3 lessons per weekj. But just through the nature of repetition, it comes naturally. And then the surprise was suddenly hearing my preschool son say definitions and poems aloud for memory, too! I was so amazed to see what happens when you gently approach something, add repetition and application, the result is beautiful. Amazing poems and stories. This book is based on good quality literature, which we value. The poems were easily memorized, and the stories are memorable with good morals. My daughter (and preschool son) LOVED listening to the stories. Narration. Because there was such amazing literature, my daughter (and preschool son) found it easy to listen to the stories and recall them in their own way. They were easily able to answer the questions provided. The critical thinking part of the picture narration was an enjoyable experience for both my daughter and I.
Copywriting. This is not my daughter’s favourite part only because she doesn’t enjoy handwriting. We have a separate notebook for keeping her work (as was suggested in the “How To Use This Book” portion. Although my daughter doesn’t particularly like handwriting, she saw the value when it came time to doing some projects, like writing up an envelope to be mailed with the mailing and return address. USA material. This is so minor that it doesn’t feel worthy to mention. It’s so easy to replace US material with Canadian whenever it does come up, which is seldom. (For example, it talks about state instead of province). This didn’t affect whether I’d use this book. 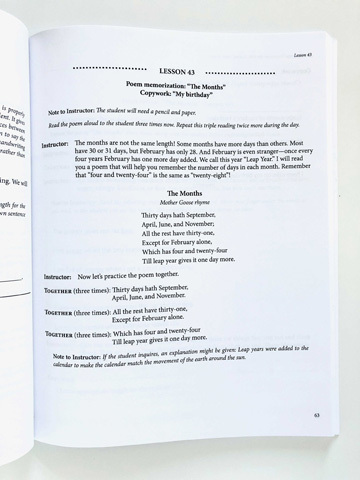 Have you tried First Language Lessons Level 1 in your homeschool? Are you considering it? I’d like to know what were your successes and challenges with the curriculum if you did try it. Leave a comment below to let me know. And yes, First Language Lessons Level 2 was certainly included in our Grade 2 curriculum picks.